An aerial shoot is one of the most complicated maneuvers -- and requires precise teamwork between pilot and photographer as well as liaison with local authorities. 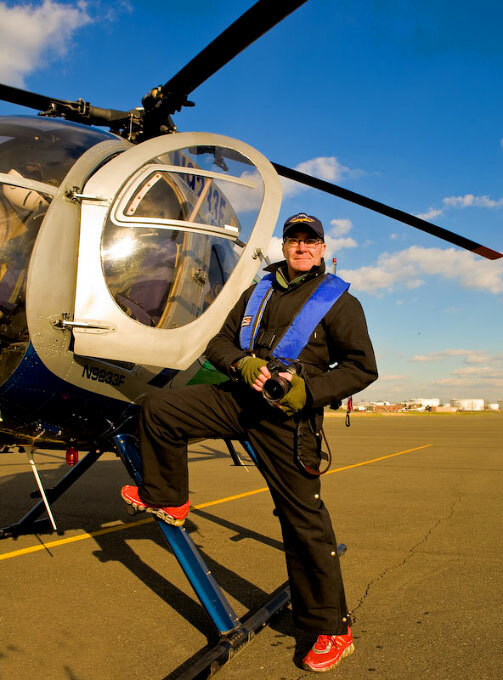 My team includes "helo" pilot Steve Bussman. Steve's photo savvy "low and slow" flying meshes perfectly with my "up close and personal" image making of maritime assignments. His specially rigged "aerial tripod," multi-rotor turbine MD500 (on the left) is uniquely equipped for my work. We are a finely tuned team, producing powerful marine imagery for Mid-Atlantic East Coast based clients. Turbine aircraft are the standard with tail rotor power to maintain a safety envelope while flying close to a large vessel. Large vessels underway produce updrafts and turbulence. Our 32 point Preparedness Lookout Alert & Notification (P.L.A.N.) Protocol is an extensive "check out" and preparation for aerial photography. It insures all factors are taken into account prior to and during aerial assignments. I thought you'd like to know some of the elements that go into P.L.A.N. -NOAA, Intellicast and Accuweather forecasts. -US Naval Observatory sunrise/sunset tables and nautical sunrise/sunset as well as azimuth. -FAA advisories and airspace restrictions. If waiver is required, contact ship's agent, and apply for waiver on behalf of client. - FAA and pilot regarding flight plan and TSA/FAA restrictions. -Apply to USCG Waterways Management for any special harbor maneuvers by vessel. - USCG Vessel Tracking System of same. -Captains of NYFD Marine One, or Fireboat John J. Harvey if water display is requested. - Gyrostabilizer, marine radio, cell phone, camera motor drives. - Co2 cartridges in Personal Flotation Devices and set for manual deployment. -Jet turbine helicopter, with marine radio frequencies. -FTP system for rush transmission of public relations images. Brief ship's agent, pilot, FAA, Sandy Hook, USCG etc. Open communications with Sandy Hook Pilot Dispatch, prior to helicopter lift-off. Contact ship on Marine Radio frequencies, once airborne. Alert governmental Film/TV boards and/or tourist commissions. Submit serial numbers to local Customs for courtesy importation of film and gear.